Delivering a new standard in eye care, this daily, high protection, non-migrating, 100% mineral base defends, enhances and optimizes the entire eye area. Formulated specifically for the unique structure of the thinner and more sensitive skin around the eye, Physical Eye UV Defense provides broad spectrum SPF 50 protection without migrating into the eyes and causing irritation. A unifying tint enhances skin tone while ceramides nourish, creating a smooth, optimal canvas for makeup application. 9% Titanium Dioxide protects against UVB and short UVA rays. 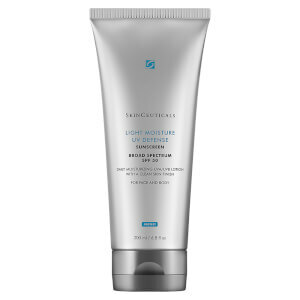 4% Zinc Oxide protects across the UVA/UVB spectrum with microfine, patented technology. Translucent color spheres for universal skin tone enhancement. Ceramides help nourish the delicate skin around the eye. Apply daily to entire eye area; under the eye, on the crow's feet area and on eyelids. Optimized for application under makeup. Perfect post surgery best eyelid sunscreen ever! After my blephoplasty they told me to always wear sunscreen on my eyelids. Everything I tried irritated my eyes made them water or burn. Or it was greasy. Then I found this it's fantastic. It never ever bothered my eyes and it has a nice tint to help cover the post scaring. And of course the sunscreen. I'll be buying this again. It's fabulous. I am always on a search for a good sunscreen especially for delicate eye area. I think this one is the best on market as of today. This is why I like it: no greasy, great under makup, doesn't over dry eye area, high SPF plus it works like eye concealer! Can't get better than this. I am religious about using sunblock on my face, but until I found this product, had nothing comparable to use on my eyelids. I bought it for the SPF50, but it also serves as a wonderful eye shadow primer. The very light beige tint looks fine alone, but you can also use it under any eyeshadow. It glides on smoothely and does not crease as the day goes on. This is one of only a few products that I love enough to purchase over and over again. The best eye sunscreen I have ever tried! 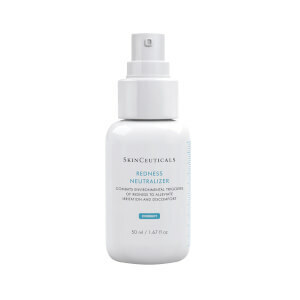 This is by far the best sunscreen for the eyes that I have ever tried and I have tried tons of products over the years. It is gentle on my allergy prone sensitive eyes and does not migrate or cause them to water. It blends perfectly and has a slightly matte finish with a subtle tint that works perfectly with my fair skin. It is an all-physical sunscreen-yea! 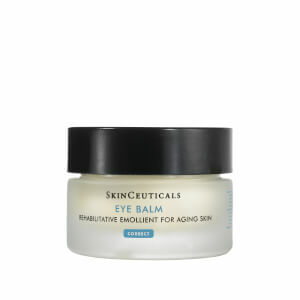 I only wish that Skinceuticals still made a physical sunscreen cream for the face that is as nice as this one. I love this product! !consealer,sun protection, non iritating, no creases, and you don't need much. I use it all around my eyes, great base also. Cream is quite thick but pats around the eyes nicely and is sufficiently dense to hide dark circles under eyes. I already use a special face sunscreen but this is a nice supplement to place around the eyes. I have sensitive eyes and this product does not aggravate my eyes. I have only been using a couple of weeks and I am not sure the cost justifies the cream. After getting my regular sunscreen in my eyes (very painful for several days) I searched for one that doesn't migrate and this is the best I have found. It is easier to use then the Clarins product (although it has it's uses) and has a higher SPF. At first I was a little put off by the color from the tube, but it goes on so smoothly and seems to just blend into my very fair skin. Also seems to be a good base for my eye make-up. I use it over an eye cream (overkill? Don't know). Glad I like it because I signed up for auto refills. This is a super nice sunscreen for the eye area that absolutely will not sting or migrate into your eyes. It dries matte and makes an excellent primer for eye makeup and/or an under-eye concealer. I've been using it for a couple of weeks and really love it!